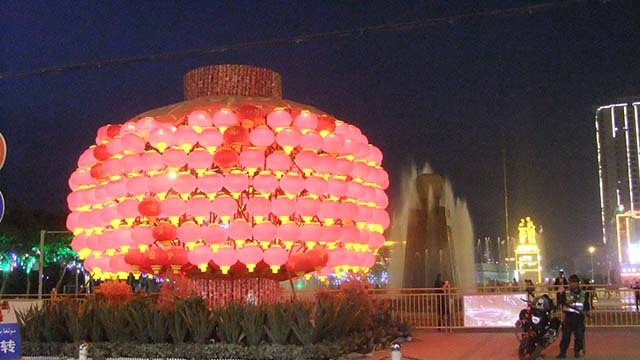 Chinese lanterns decorating the main square of Hotan, at the other end of which is a statue of Mao Zedong shaking hands with Kurban Tulum, a Uyghur farmer in 1958. As Spring Festival fever grips the Middle Kingdom, the darker side of Beijing’s war on terror mingles insidiously with the celebrations. Three thousand kilometers on the other side of China, beyond the reach of the Great Wall, the Lunar Year of the Pig has heralded a renewed push to ensure that Uyghur Muslims knuckle down to President Xi Jinping’s vision of a New Era. He could not have chosen a worse year to push his relentless experiment of uniting all 56 ethnic groups under one flag since, for Uyghur Muslims, pigs and their meat have connotations which fly in the face of their Islamic beliefs. 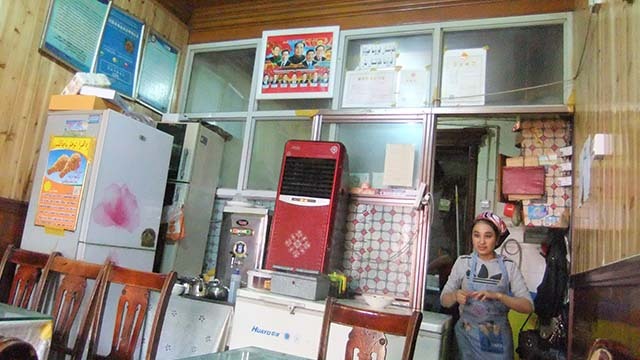 A poster of China’s presidents past and present, now compulsory wall furniture for all restaurants and cafes in Southern Xinjiang, hanging in a Uyghur snack bar. But this might not be an accident. Uyghurs this year have been compulsorily roped in as never before to take part in the festivities with their Han friends and compatriots, who they have been forced to adopt as “family,” after last year saw a million Han Chinese cadres dispatched to every part of Xinjiang to live as “relatives” of Uyghur farmers. 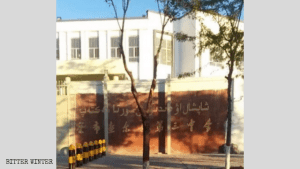 The drive is adding insult to injury after two years of unprecedented oppression which has seen at least one million Uyghurs sent to transformation through education camps, extrajudicial imprisonment or simply disappear in accord with the Chinese government’s stated ambition to rid the region of the “virus” of Islam. 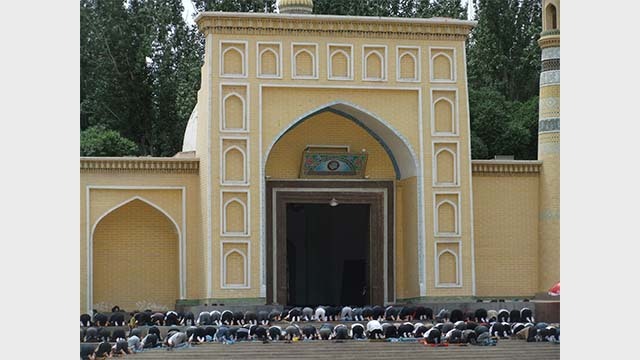 Friday prayers in Kashgar, Southern Xinjiang, 2011. Worshippers spilling out of the main Id Kah Mosque onto the front steps. Reports that celebrations kicked off with pork meat distribution to outlying Muslim villages in the Ili Kazakh Autonomous Prefecture are in line with other moves the government has been making to discourage the practice of Islam. 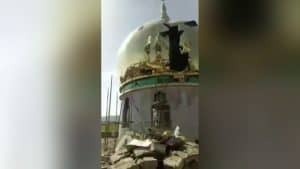 Mosques have closed or been demolished throughout the region, and now Friday prayers are a thing of the past. 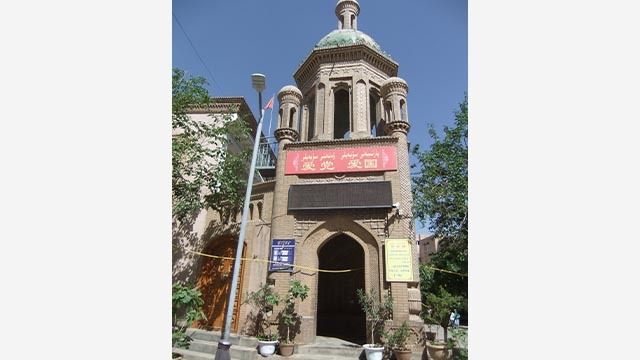 “We are too afraid to go to the mosque anymore,” said Tursun, a shopkeeper in downtown Urumqi. “For the past year, entrance with ID cards has meant that we are checked up on and risk re-education or worse, if we go.” This used to be the highlight of his week when he would gather with thousands of other men to worship and then socialize with friends over lunch or ice cream afterward. “Now we can’t even give our normal greeting ‘Aslaamu Aleykum’ or say ‘God bless you’ when we part,” he said. “We used to pray openly after food but now are even afraid to do that. People are watching everything we do, and there are cameras everywhere. 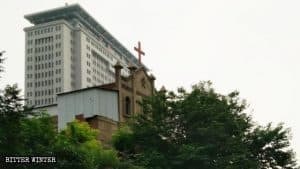 They want us to stop believing in God and become Chinese,” he added scornfully. 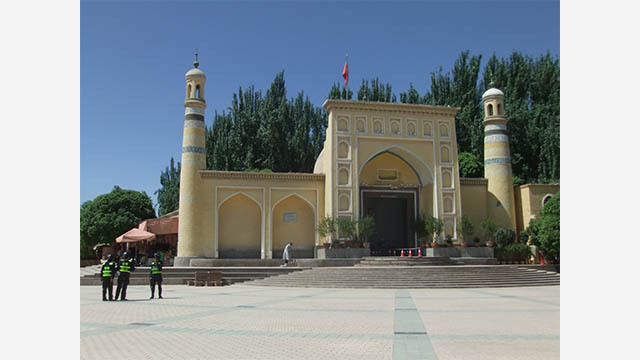 Friday prayers in Kashgar 2018. No one attends these days for fear of being sent for re-education. This year as never before, those masterminding the New Year festivities have compelled Uyghur school children to dance and sing New Year songs, dressed in traditional Chinese costumes, Uyghur officials to show evidence of their progress in “sinicization” by eating and drinking alcohol together with Han, and ordinary Uyghur people to paste the familiar red good luck banners on either side of their doors to show they are loyal Chinese citizens. 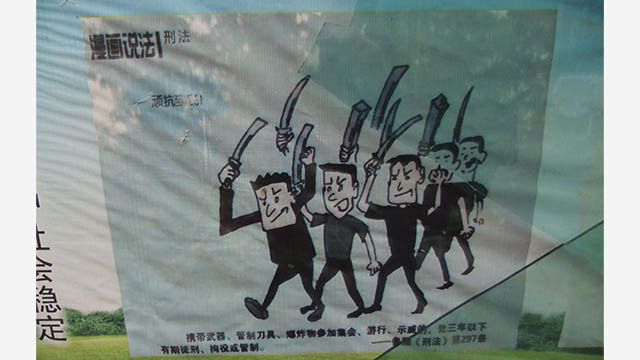 A Propaganda poster urging people to fight against the ‘three evils’ of terrorism, separatism and religious extremism. Reports on government approved websites and newspapers have come in from all around the region of Uyghurs rushing home to celebrate the festival with their families and Chinese “relatives,” hanging Chinese red lanterns in the streets, pasting fortune couplets onto door frames and making dumplings, the special Han New Year dish. 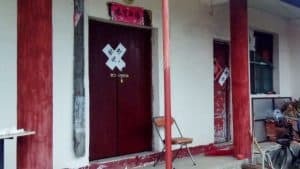 Everyone interviewed for these news reports would have known the numbers of relatives and friends missing in the camps on their doorsteps, but each had to be enthusiastic about the holiday and unanimous in their praise for Xi Jinping and his plans for China. Their own necks were at stake. 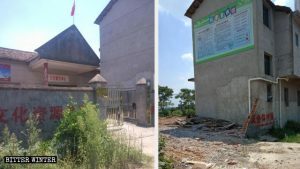 Against the sinister backdrop of mushrooming re-education camps and orphanages for tens of thousands of children abandoned once their parents are taken away, local Uyghur officials had no alternative but to be effusive in support of the regional leaders who they agreed were the best they have ever had in power. 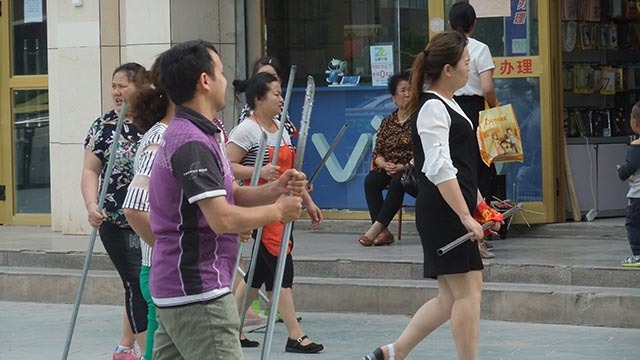 Uyghur community workers carrying medieval pole arms to use on their compatriots who step out of line, which they learn to use several times a day during the regular practice sessions. Note the pole with 4-inch nails carried by the woman in the front. President Xi Jinping in his Spring Festival address stepped up his call for patriotism and fervent socialism, and the Xinjiang Daily newspaper reiterated the need to continue the fight against the three evils of separatism, terrorism, and religious extremism. The battle would be long and protracted, it predicted with particular dangers from “two-faced” officials who “lurked beneath the surface” hoping to destroy the State from within. The government would step up its efforts to purge ideological error in the fields of education, religion, and the public sector. 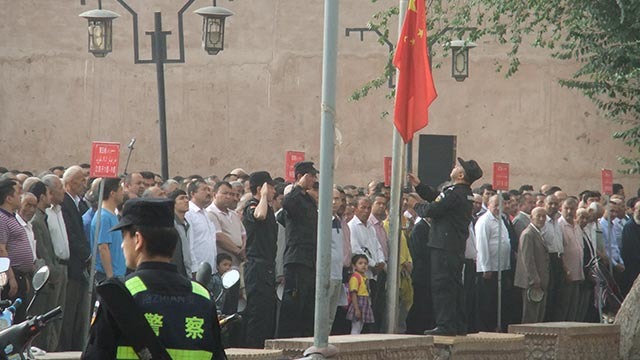 Uyghurs gather for the compulsory Monday morning political meeting in Kashgar. Failure to go results in severe penalties and often being taken away for re-education or worse. 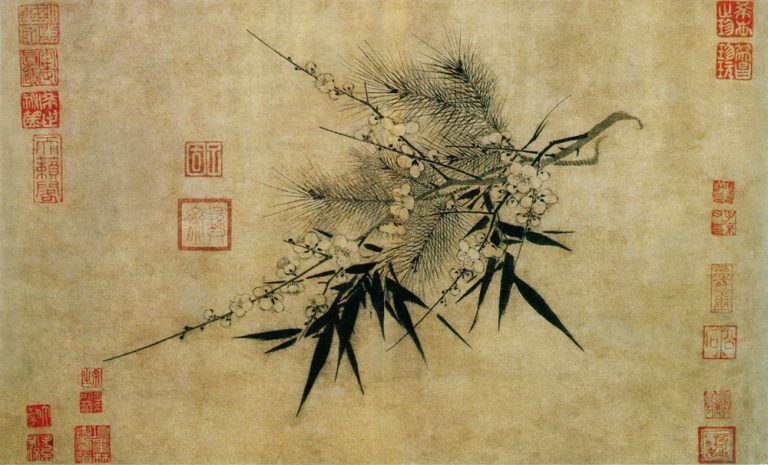 In rhetoric reminiscent of the Chairman Mao era and the Cultural Revolution, the rallying cry concluded with a mandate for a witch hunt to “courageously speak out” and prevent hostile forces from regrouping or subtly eroding the tenets of socialism in society. 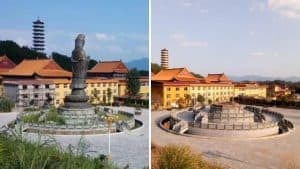 “Love the Motherland, love the People, love the Communist Party of China!” The “dormant” “two-faced people” who “eat Communist food and smash the Communist Party’s pot” should be “rooted out” and never be allowed to win. A red banner proclaiming “Love the Party! Love the Motherland” over the entrance to a community mosque, which these days is largely empty. This year’s Spring Festival message to Xinjiang’s Uyghurs is clear: Bow the knee to Xi Jinping and his vision of New China, assimilate or perish. There will be no letup. The language is combative and the methods brutal.